A social listening tool like Mediatoolkit is ideal for people who like to automate boring tasks, save precious time and generally prefer to do other things manually trying to find online mentions. This is why we are excited to announce our newest integration with the leading automation service Zapier! Zapier is the perfect service for our users. By connecting your Mediatoolkit account with Zapier, you can easily send the data collected by Mediatoolkit to other tools you use, like Slack, Gmail, Google Sheets, Evernote, Pipedrive, Salesforce. Or, you know, more than a thousand other apps. The best part is that you don’t have to wait for your developers to set it up – it’s incredibly easy to do it yourself, no coding required. For those of us who are less tech-savvy than your average developer, Zapier is a godsend. To help you get started, we created some ready-to-go zaps. Just connect your two accounts and Zapier will start sending data from Mediatoolkit to the app of your choice. A portion of our users work as local PR representatives for global companies. These big companies usually require that all links to successful media placements be delivered to the headquarters in the form of a custom spreadsheet with predefined columns. While we do have email alerts, some of you might need to customize their look and feel. Use this integration to start. When Mediatoolkit finds new mentions, Zapier will send a Gmail alert to you, your colleagues and even clients, making sure everyone is lopped in on what’s happening in a single thread. Set alerts about new online mentions somewhere your team is most likely to notice them – directly in a Slack channel. 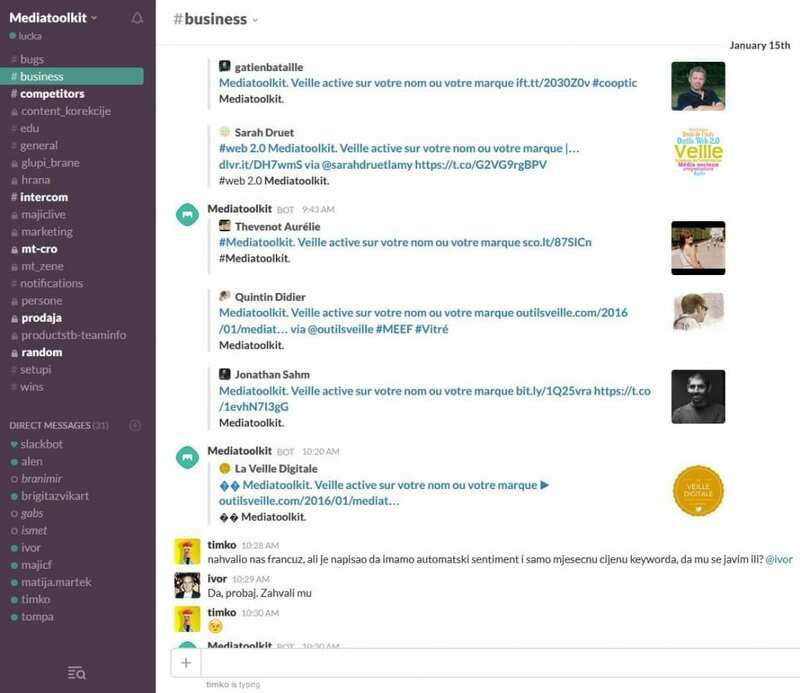 With this Mediatoolkit-Slack integration. every time Meditatoolkit finds a new mention, Zapier sends an alert to a Slack channel. This way everyone in the team is informed about new mentions in real-time, making it easier to discuss a mention or act on it. Finding it hard to keep social media followers engaged with interesting content? With the help of Zapier, half of the work is already done. Zapier will queue posts to Buffer for new mentions of topics you are following in Mediatoolkit. It is a great way to save time when sharing exciting updates about your company, like favorable reviews or customer praises on social media. You’ll never have to copy and paste social media links again! If your sales team needs new leads (and sales teams always do), why not introduce them to a whole new leads generation channel? With Zapier, you can implement social selling as part of your prospecting efforts in minutes. Monitor conversations about services similar to yours via Mediatoolkit, and Zapier will assign tasks to salespeople in Pipedrive to check out the links and reach out to the person who posted about them. Saves time on finding valuable prospects, and finds those who are already interested in your product. Need to know about new articles mentioning your company or competitors, but don’t want to open another browser tab or install another mobile app? 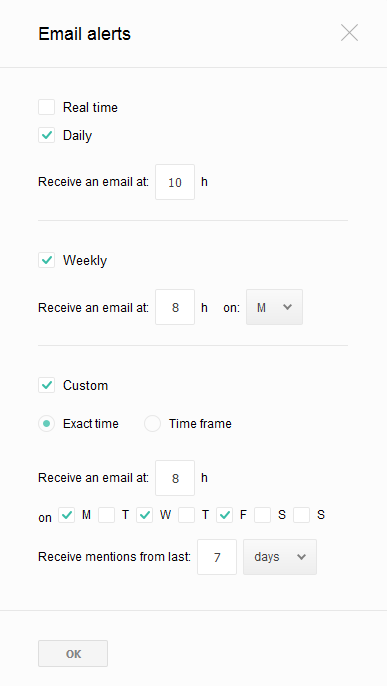 If you’re an Evernote user, this Zapier template can reduce your time and help you organize better. Connect Mediatoolkit and Evernote, and you’ll receive mentions directly to Evernote as separate notes. These examples are just scratching the surface of what is possible with Mediatoolkit and Zapier. Want to create your own custom connector? Read our step-by-step guide on integrating Mediatoolkit with other apps via Zapier.